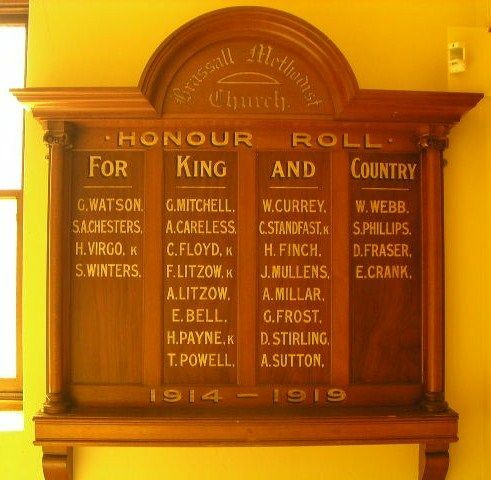 There was a large gathering at the Brassall Methodist Church on Tuesday night to witness the unveiling of the church honour board, and to accord a welcome to the returned soldiers of the district. The honour board, containing 24 names, and which reflected the greatest credit on Mr T. Brigden, who designed and built it free of charge, was unveiled by the eldest sisters of the first two soldiers to leave Brassall for the front, namely Mrs. A. Nimmo (sister of Private G. Watson), and Miss Effie Chesters (sister of Private S. A. Chesters). Queensland Times (Ipswich) (Qld. ), 6 November 1919.